Looking to continue your nonprofit education? We've got you covered. 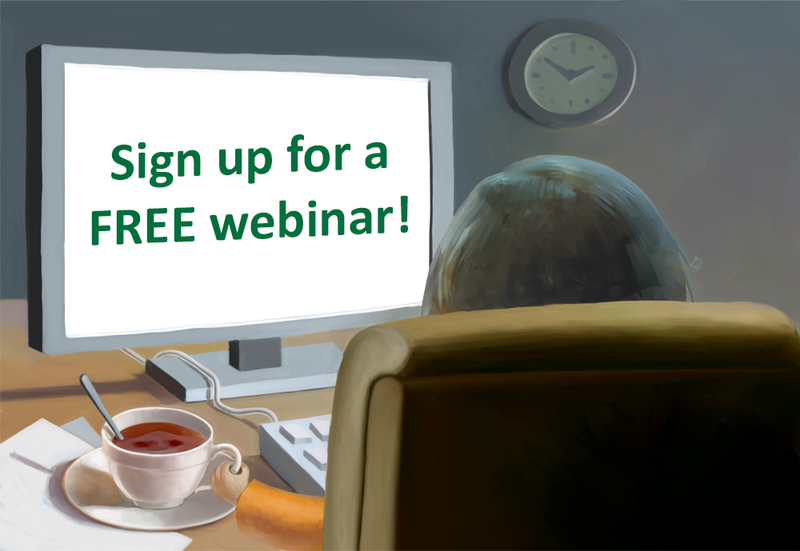 With 24 free webinars to choose from, there's something for everyone. Have a look at the list below and find some time in your schedule to help build your nonprofit knowledge base. And don't forget to share with your friends and colleagues! Often we are so busy coping with day-to-day issues that we don’t step back and see the big picture. Unfortunately this may mean we’re constantly reacting to symptoms rather than identifying and addressing causes. The problems we face in today’s organizations are complex, so we need to be able to see the trees and the forest---individual instances and recurring patterns. Learning to view and impact organizational systems is essential for accomplishing leadership goals such as strategic planning, improving staff morale, working more efficiently, addressing ongoing conflict, and fostering diversity and inclusion. During this thought-provoking webinar we will introduce systems thinking in a clear and understandable manner and then consider three actual case studies to see practical ways the ideas can be applied. For example, we’ll look at how recurring conflict was reduced in one organization by addressing systemic causes (rather than just blaming it primarily on “personalities” or “poor communication”). We will end by talking about how to carry the discussion forward with your team. Understand what taking a systems perspective means. See how taking a systems view can help your team better understand difficult organizational issues. Learn tips and suggestions for starting to explore systems in your organization. Consider systems thinking as an important attribute of leadership development. Struggling to get your board the reports they’re asking for? It doesn’t have to be difficult, as long as you have the right data paired with the right tools. Join this free webinar for the inside track on the data you absolutely must include in your next report to keep your board members happy. We’ll provide a sample format you can copy, plus we’ll answer your questions on managing your board with up-to-date information. Understand your board members’ needs and how you can meet their expectations with simple reports delivered at the right moments. Learn how to capture, track, and illustrate essential donor data and fundraising results. Discover how the right donor management system will save you time, raise more money, and help you give your board all of the data and insight they crave. It’s primary season in an election year—prime time for nonprofits to take advantage of the fundraising lessons unfolding before our eyes. Join this free webinar to learn how the top presidential campaigns mobilize supporters to raise money quickly—and how you can do the same. Whether you lean left, right, or somewhere in between, you’ll get proven fundraising tips you can implement immediately for dramatically more donations. Learn how the top political fundraisers acquire new donors and raise massive amounts of money in a short amount of time. Understand how to target the right donors at the right time with the right ask. Learn how to optimize your giving experience to convert more donors at higher average gift amounts. Discover which tools will save time, raise more money, and help you communicate more effectively with existing and potential donors. Every year, billions of dollars are distributed in response to disasters and humanitarian crises. How much of this comes from foundations? What are other sources of funding? How much funding addresses long-term recovery and disaster preparation, in addition to emergency response and immediate relief? Measuring the State of Disaster Philanthropy answers these questions. Join us for a tour of this online tool, created by Foundation Center and the Center for Disaster Philanthropy, that captures the myriad disaster-related activities that donors have supported over the past five years. By increasing knowledge about disaster giving, philanthropists, government agencies, and NGOs will be better able to coordinate their work and make more strategic decisions, ultimately resulting in more effective disaster philanthropy and assistance. Join this free webinar, hosted only once a year, to learn more about the CCVA and the process for applying for and receiving your CVA. Credentialing in any profession increases credibility and promotes career development. Learn about this unique performance-based credentialing program, the process for becoming Certified in Volunteer Administration and how it can benefit you and your organization. Recommended for those with at least 3 years of experience in any setting. There are unmistakable differences that exist between organizations that have achieved fundraising success and those that haven't. The difference that stands out the most is presence of, or lack of, a Culture of Philanthropy. This culture, like the air that we breath, is invisible, yet can be seen and felt. Plus, we’ll have plenty of time to answer your questions and help your organization see dramatically better fundraising results. What’s the most common complaint among volunteer managers? It’s that others are slow to embrace the enormous potential of volunteers to advance a program's mission. In an ideal world, your nonprofit's staff would know how to supervise volunteers and create new and purposeful opportunities for them. Getting your co-workers to that point takes buy-in. Achieving buy-in is one of the qualities that separates managers from leaders. It means standing by your vision and communicating it in a way that influences others. In this webinar, we will look at six key principles of buy-in and apply them to a typical volunteer management scenario. Come away from the hour with a new perspective on how to bring others on board with your point of view. Participants also receive a Principles of Buy-in handout and a Next Steps Worksheet as tools to help further their workplace goals. The launch of the new .NGO and .ONG domains will change how nonprofits, charities, NGOs, and ONGs worldwide use the Internet for branding for decades to come. To help you understand how and why, this webinar will discuss in detail how the .NGO and .ONG domains and their functionality differ from the .ORG domain and present a comprehensive tour of OnGood – the new global directory of validated NGOs and ONGs. Evaluations “work” when they lead to insight and action. We all know that the process can be resource-intensive, so it is important for us to maximize the probability of getting it right! In this webinar, two leading learning institutes, the Ontario Nonprofit Network (ONN) and Tamarack's Vibrant Communities Canada, will unpack real-life stories from Cities Reducing Poverty members to identify cases where evaluation worked really well. Together we will identify how they achieved exceptional success, and top takeaway points for the non-profit sector. With nationwide donor retention rates hovering around 40% year after year, it’s clear that donors aren’t happy with the way most nonprofits (possibly your organization!) are treating them. And a revolving door of donors is also costing you money! After all, it’s much more expensive for you to find a new donor than it is for you to keep a current donor. This webinar will explore the reasons why donors often stop giving to your organization and how you can change that. You will learn what donors expect when they donate and how you can meet those expectations. Be prepared to receive lots of concrete strategies for increasing the number of donors who continue giving to your organization year after year. Community Counselling Service, a highly respected fundraising firm established in 1947 in San Francisco, will lead a panel of leaders from prominent organizations in the Bay Area to discuss the implications of the latest findings from Giving USA: The Annual Report on Philanthropy. Giving USA is the seminal publication on the sources and uses of U.S. charitable giving, and the 2016 edition will be released on June 14. Past editions of Giving USA are available to use in all Foundation Center offices. This event is part of an occasional series, Perspectives on Philanthropy. In “How to Stand Out From the Crowd in Online Grant Applications” we will address how to create a concise, compelling and competitive application for online grant application scenarios.One of the common challenges is how to have your online application stand out in a sea of grant applications when you are all faced with the same formatting and character limiting requirements. CHANGE. The nonprofit sector faces relentless pressure to change from every direction. Stakeholders including clients, donors, regulators, partners, staff, and volunteers push for change. Technological advancement, talent management trends, competition with social enterprise, political shifts, and cultural norms all create conditions requiring nonprofits to evolve. This session provides nonprofit managers with an approach for responding to this environment of never-ending change by creating a more resilient and resolute organization. The United Nation’s recent adoption of the Sustainable Development Goals (SDGs) serves as a uniquely valuable opportunity for philanthropy, nonprofit, and civil society. More than 190 world leaders are committed to 17 global goals that will help us fight extreme poverty, end inequality, and fix climate change across the world. If we want to have a chance at achieving these goals of a more equitable and sustainable world, we'll need your help because of the unique role you play in the social sector. The SDGs are applicable to the entire world, constituting a unified global development agenda. Because the SDGs provide a comprehensive, globally relevant framework for development, Foundation Center believes that nonprofits and civil society should familiarize themselves, at minimum, with the indicators of change that have been developed to account for progress towards each goal. These are the numbers that the world will be watching to see if progress is being made, and they will quickly become one of the most important yardsticks against which the impact of foundations working in an area related to the SDGs will be measured. Be informed and learn how to connect your work to these worldwide goals. Discover ways to connect local and regional work to global development progress through partnerships and funding opportunities.